It can be just as daunting choosing the right button holes for the wedding as the bridal flowers. It's up to you if you want to supply everyone attending the ceremony with buttonholes, but most people are happy to buy their own to match their outfit, or come with fascinators or other accessories fitting for their style. In days gone by every single wedding guest wore a flower in their lapel, and if you love the thought of a traditional wedding, supplying everyone with flowers is a guaranteed way of ensuring your wedding photos reflect this feeling of unity. Buttonholes and corsages are a must for members of the wedding party, so any relatives of the couple, the best man, maid of honour and the ushers will all need a flower. It's a nice way of showing who is important to the couple during the ceremony for the other guests – especially if people haven't met before, as is the case with most weddings nowadays. Some brides choose to have their chosen theme carried through the buttonholes, so choose their focal flower like an orchid, rose or thistle for the buttonholes and corsages for the wedding party. Others like to choose separate flowers or colours for each family side. The mother-of-the-bride tends to have a very glamorous buttonhole, tailor-made to her outfit with touches of the bridal bouquet entwined. The groom tends to have a mixture of the flowers from the bride's bouquet or a double rose. Men always wear their flowers facing up and to the left and women are – of course – always right! Ladies' corsages tend to face downwards and are arranged by the florist to look best this way. You can ask for the stems to be covered in ribbon, special florists' tape or decorated holders. 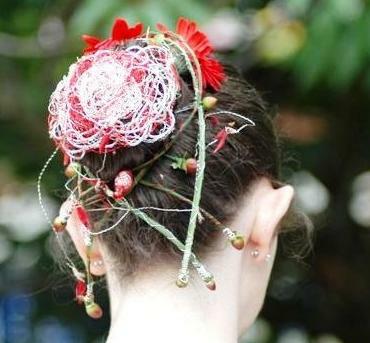 If you're not a stickler for tradition, why not go for flower accessories rather than buttonholes? You could choose from floral fascinators, wrist corsages or lapel decorations that drape over the shoulder for special guests of the wedding party. You can even choose more elaborate versions of these for your own wedding flowers – that way, you've got your hands free all day, and don't need to worry about putting your bouquet in water or constantly putting it down somewhere where it won't get damaged.